Gellco Clothing and Shoes has been selling the best brands of safety footwear for over 60 years. 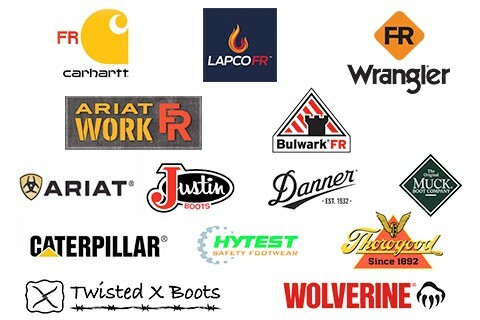 We carry over 30 brands from the best in the industry. With the largest selection of safety footwear in Oklahoma, Gellco is sure to have the right boot at the right price. Our trained staff will take the time to fit you up in a pair that will be up to the task to keep you comfortable and compliant. When you need the best Flame Resistant Clothing for the job, you need to get it from Gellco. We have enough FR clothing in stock to fit you up, or fit up your whole crew. We carry the hardest working brands that keep you compliant. Gellco also offers Flame Resistant Corporate Programs that can be run through our 5 store locations or web-based nationwide.